The Universal Design Meets the Exit Sign White Paper presents the case for a new generation of exit signs to to be used in all forms of transportation, facilities and buildings. The White Paper discusses the many complex issues that have lead to the develop of this initiative and argues for the support of these new emergency and exit signs. 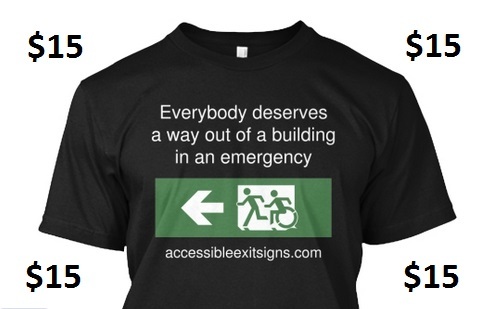 The performance-based template provides support to accept the use of The Accessible Exit Sign Project signage as a variation from the prescriptive ‘Deemed-to-Satisfy’ provisions of the building code. The template also provides support for this approach with consideration to the content of the White Paper. 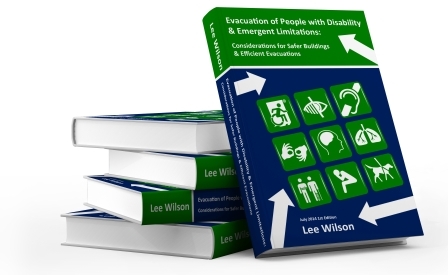 It proposes the use of a performance-based building solution to accept that emergency egress and exit signage provided throughout the building will adopt a best practice ‘universal design’ approach and argues that this approach provides a safer solution for all building occupants, including people with disabilities.  The proposed signs presented in the assessment form part of the ‘Accessible Exit Sign Project’, which adopt the ‘Accessible Means of Egress Icon’ on all emergency egress and exit signage used throughout the building. Please click the image of the cover of the Performance Assessment Template cover below to open the document, which can then be downloaded directly to your computer. The Accessible Exit Sign Project has been featured on page 3 of Issue 85 of The Professional Engineer journal, published by the Society of Professional Engineers. The article announces that Safety Sign Sales Ltd in Christchurch, New Zealand are now a licensed partner of the project. 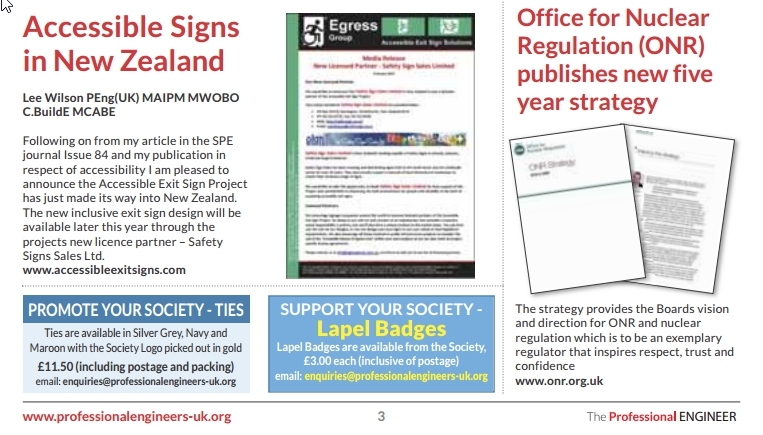 The Society of Professional Engineers is based in the UK, but has an international membership. Please consider visting the Society’s website and reviewing their great work.